1. METAL W GENUINE LEAHER DESIGN: A smooth metal surface combined perfectly with genuine leather, showing a sense of high level. 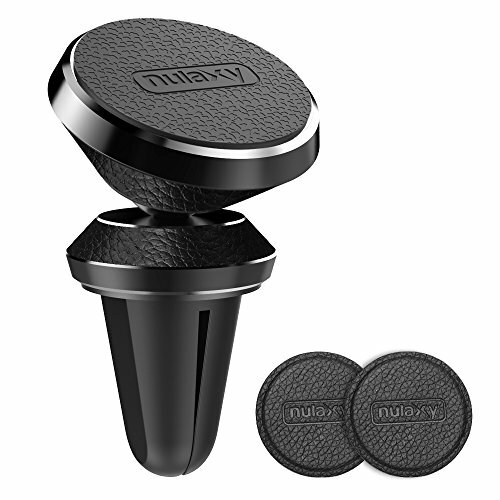 The high quality construction of the base of Nulaxy magnetic phone mount cradle is sturdy enough to keep your smartphone in place, no matter how bumpy the road is. 3. VERSATILE VIEWING: Highly-flexible rotation provides you versatile viewing angles , enable you to adjust your smartphone and swivel your display as you please. Just position your phone at the perfect angle to enjoy a more relaxed and safer drive. 4. MULTIPLE APPLICATIONS: Nulaxy magnetic car mount is not just a car holder, it can also work as a stand holder. Use the magnetic mount holder when you're at home as a cell phone stand holder for comfortable and hands-free use. 5. EASY TO USE: Simply insert the mount into the air vent of your car, stick the metal plates onto the back of your phone and attach your phone to the magnetic area.